In the Notice of Proposed Rulemaking (NPRM) the Federal Communications Commission (Commission) proposed to permit higher-powered unlicensed device operation in the 5725-5875 MHz band. Under the Commission�s proposal, this higher-powered unlicensed device operations would be limited to rural areas or areas where it is determined that spectrum use is limited. The Commission proposed that the unlicensed devices operating in these rural or unused areas employ dynamic frequency selection (DFS) with a detection threshold of 30 dB above the thermal noise floor within a measurement bandwidth of 1.25 MHz. The Federal Government users in the 5725-5875 MHz band are fixed, transportable, and mobile radar systems operated by the Department of Defense (DoD) that are used primarily for surveillance, test range instrumentation and experimental testing. These radar systems are used extensively in support of national and military test range operations in the tracking and control of manned and unmanned airborne vehicles. As pointed out in the NPRM, many of the installations where these radar systems operate are located in rural areas to avoid interference with other systems. There is also a growing concern regarding potential interference to these radar systems related to their expanding role in support of homeland defense. This expanded role could result in a requirement to deploy radar systems in areas close to cities and highways, potentially increasing interference to the radar systems from unlicensed devices operating at the higher power levels. The potential interference between military radar systems operating in the 5250-5350 MHz and 5470-5725 MHz and Unlicensed National Information Infrastructure (U-NII) devices employing DFS was addressed as part of another Commission rulemaking proceeding. A similar analysis must be performed in the 5725-5875 MHz band in order to assess whether the power levels and detection threshold proposed by the Commission are adequate to protect these radar systems. This appendix describes: the operational scenario for the unlicensed devices and the military radar systems used in the assessment; the technical characteristics of the radar systems and unlicensed devices used in the assessment; and the engineering algorithms used to assess the potential for interference to the radar systems from the DFS equipped unlicensed devices. The analysis will assess whether the proposed power levels and detection threshold is adequate to protect the radar systems. The NPRM does not propose a specific higher powered unlicensed device application in the 5725-5875 MHz band. However, it does indicate that local area networks and Wireless Internet Service Providers (WISP) would benefit from the proposed higher power levels. In another rulemaking the Commission expects that the primary use of unlicensed devices in rural areas would be to provide wireless Internet services such as those provided by WISPs. The higher power levels proposed by the Commission will in all likelihood not be used in hand-held or laptop unlicensed device application because of radiation hazard and battery life issues. In this assessment, the number of unlicensed devices will be varied and the locations of the unlicensed devices will be randomly distributed in a circular region defined by a radius of 25 kilometers. It is assumed that all of the unlicensed devices are transmitting and are co-channel with the radar system. The antenna heights will be randomly assigned to each unlicensed device, using a uniform probability distribution. The range of the antenna heights considered in the analyses are: 6 to 10 meters; 10 to 40 meters, or 40 to 100 meters. Two aspects are considered when positioning the radar with time, one taking into account the physical location of the radar and the other taking into account the scanning ability of the radar beam. The radars operating in the 5725-5875 MHz band include: ground-based (scanning and tracking), airborne, and maritime systems. In the technical studies examining interference from DFS equipped U-NII devices, it was determined that radars employing tracking beam scans were the most susceptible to interference. A tracking beam scan was defined as a beam pointing at the horizon in any direction that then moves directly overhead and opposite to the starting location to the horizon. The location of the tracking radar and the azimuth of the beam will be varied to determine where the highest interference level occurs. The Commission proposed two emission levels for the higher-powered unlicensed devices operating in the 5725-5875 MHz band: 1) transmitter power of 6 watts and 2) a field strength limit of 125 milliVolts per meter (mV/m) at a reference distance of 3 meters. Converting these emission levels to equivalent isotropically radiated power (EIRP) levels results in 38 dBm (6 watts) and 6.6 dBm (125 mV/m). In this assessment, two transmitter power distributions are considered: 1) 50% of the unlicensed devices operating at the higher EIRP level of 38 dBm and 50% operating at the lower EIRP level of 6 dBm; and 2) 100% of the unlicensed devices operating at the higher EIRP level of 38 dBm. There are two bandwidths of concern for unlicensed devices employing DFS. The first bandwidth is the transmitter bandwidth used by the unlicensed device. The second is the bandwidth used to measure the DFS detection threshold. The Commission did not define the bandwidth for the unlicensed device. In this assessment, three transmitter bandwidths are considered for the unlicensed devices: 1 MHz, 6 MHz, and 18 MHz. The 1 MHz bandwidth of the unlicensed device is matched to the radar receiver bandwidth of 1 MHz, which represents a worst case from an interference perspective. The 6 MHz bandwidth is representative of the transmit bandwidth used by fixed wireless access systems. The 18 MHz bandwidth is consistent with that employed by U-NII devices. As discussed in the NPRM, the Commission defined the measurement bandwidth for the DFS detection to be 1.25 MHz. In another rulemaking, the Commission stated that in rural areas unlicensed devices would typically employ omnidirectional antennas in order to achieve the most uniform coverage of a particular geographic area. 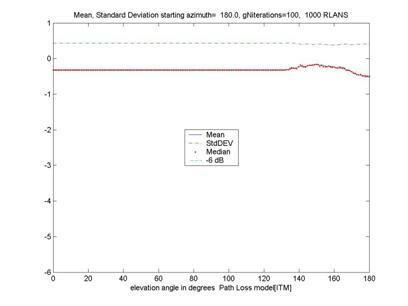 The unlicensed device antenna pattern used in this assessment is omnidirectional in the azimuth plane. The unlicensed device antenna pattern in elevation orientations was determined by examination of unlicensed device antenna patterns. The unlicensed device antenna elevation pattern is defined in terms of the antenna gain in dBi as a function of the elevation angle (Φ) in degrees. The antenna elevation pattern used in this analysis is described below in Table A-1. Representative technical and operational characteristics of the radar systems used in this analysis are provided in Recommendation ITU-R M.1638. The ITU-R Recommendation provides the transmitter power level, mainbeam antenna gain, transmitter and receiver bandwidths, and receiver noise figure for each type of radar included in the analysis. Table A-2 provides the characteristics of the radar transmitter and receiver used in this analysis. A model representing the envelope of the gain of typical directional antennas is used to determine the radar antenna gain in the azimuth and elevation orientations. 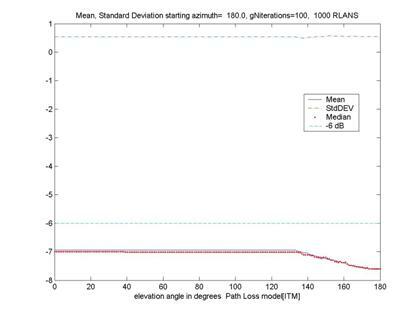 The model gives the antenna gain as a function of off-axis angle (θ) for a given main beam antenna gain (G). Figure A-1 illustrates the general form of the antenna gain distribution. The equations for the angles θM (first side-lobe shelf), θR (near side-lobe region), and θB (far side-lobe region) are given in Table A-3. The antenna gains, as a function of off-axis angle, are given in Table A-4. The angle θ is in degrees and all gain values are given in terms of decibels relative to an isotropic antenna (dBi). This model will employ a far-field antenna pattern for the radar systems, even though the unlicensed devices will sometimes be located within the antenna near-field. 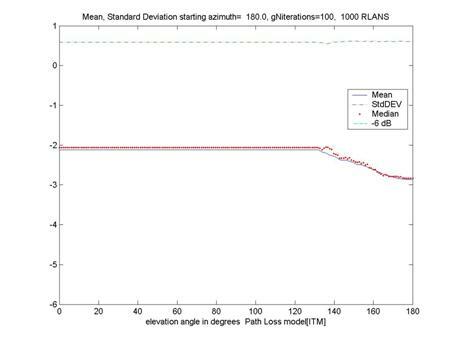 This approach is used because of the complexity of modeling the radar antenna in the near-field, and will provide results that may be more conservative than those that would be expected if the near-field effects could be easily modeled. This section describes the engineering algorithms that are used in the model. Radar systems and unlicensed devices operating co-channel in proximity could produce a scenario where mutual interference is experienced. The methodology provided in ITU-R recommendation M.1461 is used to compute the received interference power levels at the radar and unlicensed device receivers. A DFS algorithm may provide a means of mitigating this interference by causing the unlicensed devices to migrate to another channel once a radar system has been detected on the currently active channel. This model first considers the interference caused by the radar to the unlicensed device at the output of the unlicensed device antenna. If the received interference power level at the output of the unlicensed device antenna exceeds the DFS detection threshold, the unlicensed device will cease transmissions and move to another channel. The model then computes the aggregate interference to the radar from the remaining unlicensed devices. Each of the technical parameters used in the model and the radar interference criteria will also be described. This received signal level from the radar at the output of the unlicensed device antenna is evaluated by using Equation A-1. FDR = Frequency dependent rejection (dB). Equation A-1 is calculated for each unlicensed device in the distribution. The value obtained is then compared to the DFS detection threshold under investigation. Any unlicensed device for which the threshold has been exceeded will begin to move to another channel, and thus is not considered (for the remainder of the analysis) in the calculation of interference to the radar, as given by Equation A-2. Using Equation A-2, the values are calculated for each unlicensed device being considered in the analysis that has not detected energy from the radar in excess of the DFS detection threshold. These values are then used in the calculation of the aggregate interference to the radar by the unlicensed devices using Equation A-3. IRADAR = Interference into the radar from an individual unlicensed device (Watts). It is necessary to convert the interference power calculated in Equation A-2 from dBm to Watts before calculating the aggregate interference seen by the radar using Equation A-3. The following subsections discuss each of the parameters used in the analysis model. These parameters include: unlicensed device and radar technical characteristics such as power and antenna gain, the radiowave propagation models, and frequency dependent rejection. The peak power levels of the radar that is used in this analysis is provided in Table A-2. The azimuth and elevation antenna pattern models for the radar are described earlier. 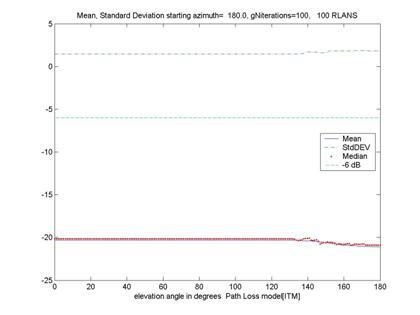 The models give the antenna gain as a function of off-axis angle for a given main beam antenna gain. 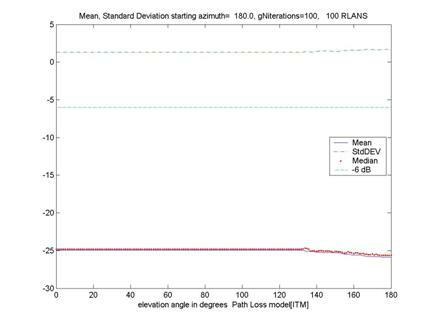 The radar mainbean antenna gain used in this assessment is provided in Table A-2. As discussed earlier, the EIRP levels of the unlicensed devices considered in this analysis are 38 dBm and 6.6 dBm. The unlicensed device azimuth antenna pattern is omnidirectional and elevation antenna pattern model is provided in Table A-1. The building and non-specific terrain losses include building blockage, terrain features, multipath. In the analysis this loss will treated as a uniformly distributed random variable between 1 and 10 dB for each radar unlicensed device path. The analysis includes a nominal 2 dB for the insertion losses between the transmitter and receiver antenna and the transmitter and receiver inputs for the radar and the unlicensed device. To compute the radiowave propagation loss the NTIA Institute for Telecommunication Sciences Irregular Terrain Model (ITM) was used. The ITM model computes radiowave propagation based on electromagnetic theory and on statistical analysis of both terrain features and radio measurements to predict the median attenuation as a function of distance and variability of the signal in time and space. The parameter values used in the ITM propagation model are provided in Table A-5. Vertical polarization is used for the radar and unlicensed device. 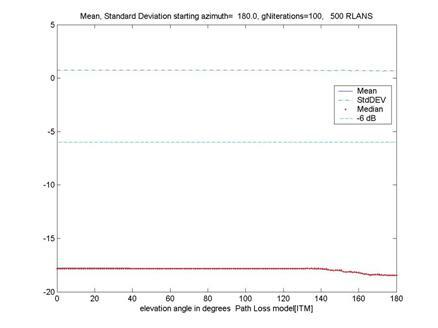 For each transmitter/receiver path, the ITM model is used to compute the propagation loss as a function of three random variables: distance, antenna height for the unlicensed device and mode variability. The distance depends on the random placement of the unlicensed devices with respect to the radar. 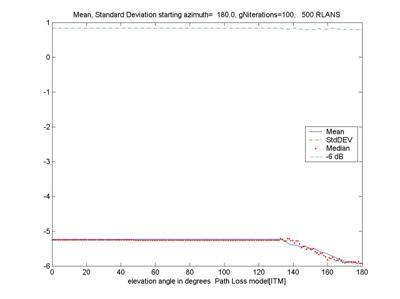 The antenna height for each unlicensed device is randomly selected using a uniform probability distribution. The time/location variability is chosen randomly for each path based on a uniform probability distribution. Frequency Dependent Rejection (FDR) accounts for the fact that not all of the undesired transmitter energy at the receiver input will be available at the detector. FDR is a calculation of the amount of undesired transmitter energy that is rejected by a victim receiver. This can be found in Recommendation ITU-R SM.337-4 Annex 1. Numerical integration and convolution routines can be used to solve equation A-4. = Input bandwidth of the victim receiver. The analysis model only considers co-channel operation of the radar and unlicensed devices, therefore Equation A-5 is used to compute the FDR. The desensitizing effect, on a radar system from other services of a noise-like type modulation such as those from the unlicensed devices is predictably related to its intensity. In any azimuth sectors in which such interference arrives, its power spectral density can, to within a reasonable approximation, simply be added to the power density of the radar receiver thermal noise. 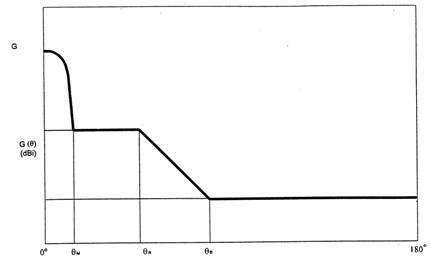 NF = Receiver noise figure (dB). Recommendation ITU-R M.1461 states that if no specific I/N ratio is provided for a given radar, the protection criterion of I/N = �6 dB should be used. This protection criterion applies 100% of the time. The contribution of the output from an unlicensed device that has detected the radar and has begun to move from the affected channel should not be considered in calculating the aggregate interference power at the radar receiver input. The detection threshold is then found to be: -113 + 30 = -83 dBm. This detection threshold will be used in the assessment. This analysis considers ground-based tracking radars. The analysis model distributes unlicensed device locations randomly within the circular region described earlier. Initially the radar will be located along a straight line starting at the center of the circle (0 km) and extending to the end of the circle (24 km) in 4 km increments: 4 km, 8 km, 12 km, 16km, 20 km, and 24 km. The analysis begins by placing the radar at one of these six locations. At each of the six locations one of five azimuths: 0, 45, 90, 135, and 180 degrees are used. For each starting azimuth, the analysis then begins calculating IU for each unlicensed device, assuming the main beam of the radar antenna is pointing at 0 degrees elevation in the direction of the starting azimuth. The analysis then proceeds to compare each individual value of IU to the DFS detection threshold. For each IU that exceeds the DFS detection threshold, the corresponding unlicensed device is eliminated from further consideration during the analysis. The probability of DFS detection is 100% when the detection threshold is exceeded. IRADAR is then calculated for each unlicensed device remaining in the analysis, and is then used to calculate IAGG. The radar elevation angle is then incremented by one degree and the calculations are repeated. This process is continued until the main beam of the radar antenna is pointing directly at the zenith (elevation = 90 degrees). The analysis then continues the calculations by decrementing the elevation angle one degree at a time. In that way, this process provides simulation of the radar�s tracking of a target from horizon-to-horizon, passing directly overhead. That is the initial model run for 0 degrees elevation of the radar antenna, the location and antenna height of each unlicensed device is selected. Also, the building and non-specific terrain loss factor and the propagation variability for each radar-to-unlicensed device propagation path are selected. These factors do not change as the radar antenna pointing angle is moved from horizon-to-horizon. Only the antenna gain values change according to elevation angle. 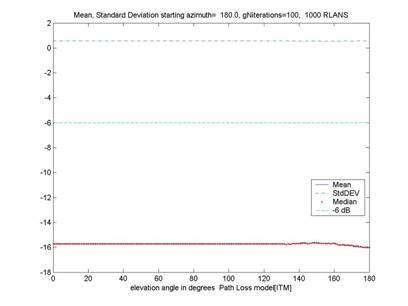 If the DFS threshold is exceeded at a specific elevation angle, that unlicensed device is moved to another channel for the remainder of the horizon-to-horizon analysis. These aggregate values are then used to calculate the I/N ratio and an example are plotted as shown in Figure A-2. Based on the radar locations and starting azimuths described above, there was very little variation in the analysis results based on the placement of the radar and the starting azimuth. The I/N values were found to be slightly higher when the radar was positioned at the edge of the circle defining the unlicensed environment and the starting azimuth was 180 degrees (e.g., pointed away from the unlicensed device environment). This radar position and starting azimuth are used in the analysis to assess potential interference to the radar system. The number of co-channel, simultaneously transmitting, unlicensed devices considered in the analysis was: 100, 500, and 1000. In order to develop statistics 100 iterations of the model were generated. 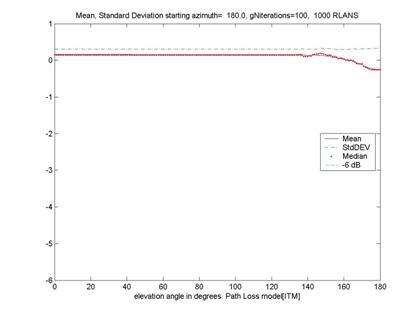 For each iteration the following parameters are randomly varied: unlicensed device location, antenna heights of the unlicensed devices, propagation losses, and losses due to non-specific terrain effects. Based on the 100 iterations, a mean, median, and standard deviation are computed. Figures A-3 through A-5 present analysis results with half of the devices operating at the higher proposed power level of 38 dBm and half operating at the lower proposed power level of 6 dBm. The antenna heights of the unlicensed devices are randomly varied between 40 and 100 meters. The transmitter bandwidth of the unlicensed devices is 1 MHz. Figures A-6 through A-8 present analysis results with half of the devices operating at the higher proposed power level of 38 dBm and half operating at lower proposed power level of 6 dBm. The antenna heights of the unlicensed devices are randomly varied between 40 and 100 meters. The transmitter bandwidth of the unlicensed devices is 6 MHz. Figures A-9 through A-11 present analysis results with half of the devices operating at the higher proposed power level of 38 dBm and half operating at the lower proposed power level of 6 dBm. The antenna heights of the unlicensed devices are randomly varied between 40 and 100 meters. The transmitter bandwidth of the unlicensed devices is 18 MHz. Figures A-12 through A-14 present analysis results with all of the devices operating at the higher proposed power level of 38 dBm. The antenna heights of the unlicensed devices are randomly varied between 40 and 100 meters. The transmitter bandwidth of the unlicensed devices is 1 MHz (Figures A-12), 6 MHz (Figures A-13), and 18 MHz (Figures A-14). Figures A-15 through A-17 present analysis results with all of the devices operating at the higher proposed power level of 38 dBm. The antenna heights of the unlicensed devices are randomly varied between 10 and 40 meters. The transmitter bandwidth of the unlicensed devices is 1 MHz (Figures A-15), 6 MHz (Figures A-16), and 18 MHz (Figures A-17). Figures A-18 through A-20 present analysis results with all of the devices operating at the higher proposed power level of 38 dBm. The antenna heights of the unlicensed devices are randomly varied between 6 and 10 meters. The transmitter bandwidth of the unlicensed devices is 1 MHz (Figures A-18), 6 MHz (Figures A-19), and 18 MHz (Figures A-20). 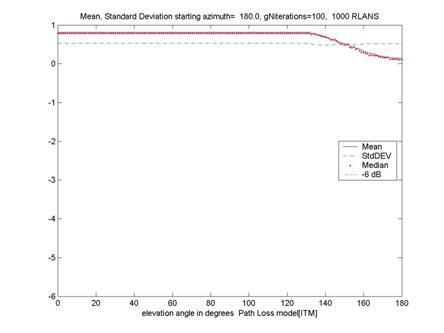 A summary of the analysis results in terms of the mean I/N for the 100 iterations and the standard deviation are provided in Table A-6 for each analysis case considered in this assessment. The analysis results indicate the I/N is dominated by the number of higher-powered unlicensed devices. The percentage of lower powered unlicensed devices does not impact the computed I/N values. The antenna heights of the unlicensed devices have little effect on the computed I/N values. As expected the increase in calculated I/N follows a 10 Log (number of unlicensed devices) relationship. In all but one case (100 unlicensed devices with 50% operating at the high power level) the 1 MHz transmit bandwidth resulted in computed I/N values that exceeded the threshold of I/N of -6 dB.
. Facilitating Opportunities for Flexible, Efficient, and Reliable Spectrum Use Employing Cognitive Radio Technologies, Notice of Proposed Rulemaking, ET Docket No. 03-108, 18 F.C.C. Rcd. 26859 at � 42 (2003) (�Cognitive Radio NPRM�).
. Id. at � 44.
. DFS is a mechanism that dynamically detects signals from other systems and avoids co-channel operation with these systems.
. Cognitive Radio NPRM at � 44.
. The frequency bands from 5250-5925 MHz are allocated on a primary basis to the government radiolocation service.
. Cognitive Radio NPRM at � 43.
. Revision of Parts 2 and 15 of the Commission�s Rules to Permit Unlicensed National Information Infrastructure (U-NII) Devices in the 5 GHz Band, Report and Order, ET Docket No. 03-122, 18 F.C.C. Rcd. 24484 (2003).
. Cognitive Radio NPRM at � 38. The proposed power levels would increase the coverage of by a factor of 6.
. Additional Spectrum for Unlicensed Services Below 900 MHz and in the 3 GHz Band; Amendment of the Commission�s Rules with Regard to the 3650-3700 MHz Government Transfer Band, Notice of Proposed Rulemaking, ET Docket No. 04-151; ET Docket No. 02-380; ET Docket No. 98-237, FCC 04-100, 2004 FCC LEXIS 2071, at � 43 (2004) (�3650-3700 MHz NPRM�).
. Recommendation ITU-R M.1638, Characteristics of and Protection Criteria for Sharing Studies for Radiolocation, Aeronautical Radionavigation and Meteorological Radars Operating in the Frequency Bands Between 5250 and 5850 MHz (2003).
. Each radar location/azimuth location and distribution of unlicensed device locations is defined as a trial.
. Cognitive Radio NPRM at � 38.
. 3650-3700 MHz NPRM at � 43.
. Joint Spectrum Center, JSC-CR-96-016B, JSMSW Interference Analysis Algorithms, at 2-11 (April 1998).
. Recommendation ITU-R M.1461, Procedures for Determining the Potential for Interference Between Radars Operating in the Radiodetermination Service and Systems in Other Services, at Annex 1 (2000).
. National Telecommunications and Information Administration, NTIA Report 82-100, A Guide to the Use of the ITS Irregular Terrain Model in the Area Prediction Mode (April 1982).
. Recommendation ITU-R SM.337-4, Frequency and Distance Separations (1948-1951-1953-1963-1970-1974-1990-1992-1997).
. Because the unlicensed devices are distributed uniformly, the actual location of the tracking radar is not believed to be a critical parameter in the analysis provided that a sufficient number of radar locations and starting azimuths are considered.
. ITU-R M.1652 at Annex 4.